In general, what are some reasons people might experience lower back pain? Our lumbar spine was not designed to be manipulated and moved greatly. Although it might feel great when it is “cracked”, this is all temporary, like a bandage, but the pain in lumbar spine does not go away. It is designed to be stable. So according to the kinetic chain theory, if our hips are limited in mobility, the nearest complex to compensate is the lumbar spine. It will cause movement in lumbar spine that is not necessary because our CPU (brain) is going to have our body complete the task at hand with path of least resistance. The same goes for limitations in the thoracic spine, which should be mobile. This mobility allows us to rotate at our desk, hit a golf ball properly, take our kids in and out of car and to throw a ball, to name a few examples. With this limitation in mobility in our thoracic spine, typically our lumbar spine will try to make up for that limitation even though it does not have the same degrees of freedom of motion. We need to be more cognoscente of our bodies movement patterning and when we recognize something as painful in the lumbar spine, we need to take a step back to understand “WHY” this pain is occurring. Since the lumbar spine should be more stable than mobile, the main driving force for lumbar stability is creating proper intra-abdominal pressure. When we breath correctly we create a natural stabilization protocol for our lumbar spine. Natural breathing mechanics, diaphragmatic breathing, is the way we breath coming out of the womb. The diaphragm has dual functions: respiration and stability. Through injuries and improper training, most have lost this innate breathing process. This is due mainly because being an upper respiratory breather is much easier and quicker, but not efficient as diaphragmatic breathing. As we inhale, the rib cage expands, the diaphragm muscle drops down and the pelvic floor rises (like squeezing an Oreo). Through this mechanism, intra-abdominal pressure build up and creates stability around our entire abdominal cavity and lumbar spine. Exhalation is a passive movement and everything relaxes. Think of a soda can analogy compared to our body – when pressure is placed on top of a FULL soda can, nothing changes in the soda can. When pressure is placed on an empty soda can, the can collapses because there is no internal pressure to protect the can. 2009 Study in Archives of Internal Medicine. Cecil G. Sheps Center for Health Services Research at the University of North Carolina at Chapel Hill. Correct breathing is the start to effectively relieve lower back pain. Since on average we take about 21,000 breaths/day, what other exercise can be done more than this daily. Lay on your back and focus on breathing through the diaphragm by putting one hand on your stomach and one hand on your chest. Feel your ribs expand and your belly laterally expand. If your hand on your chest moves, then your breathing too much from your upper chest region. Do this for 2 minutes correctly. Stabilizing the spine is critical for decreasing lower back pain and having the ability to understand how to do to this requires simplifying exercises to achieve the basics. Lay on your back – maintain your lumbar flat – raise your hip and knees to 90 degrees. Hold this positon and continue to hold your lower back flat against the floor surface. Focus on diaphragmatic breathing. 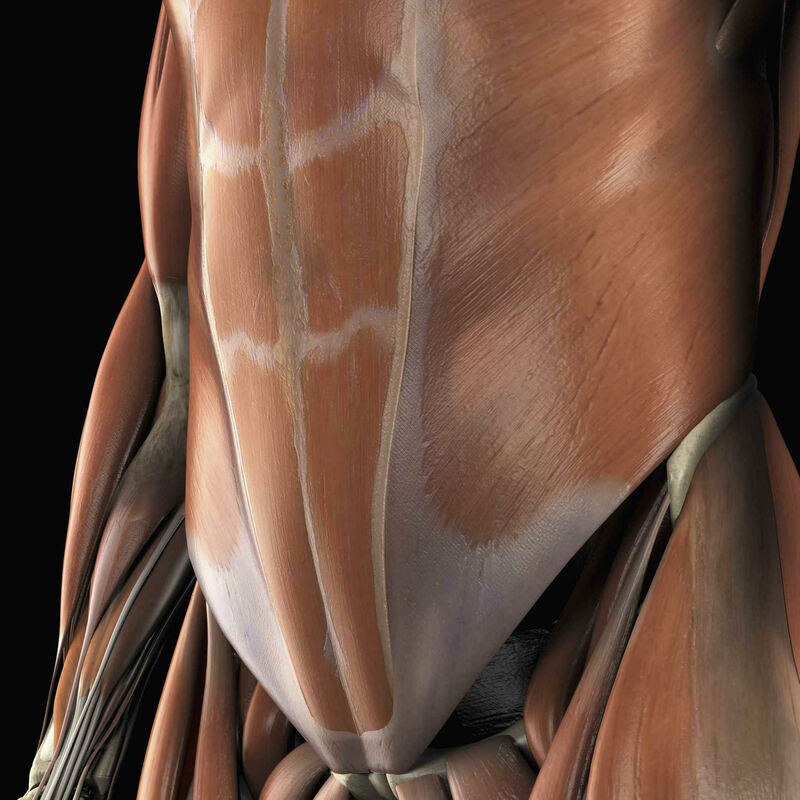 If your hip flexors fatigue before your core than you did not stabilize the trunk well enough. Remember, a 4 month old baby can hold this position for nearly 2 hours playing with toys, so we should be able to do it for at least 1 minute. Know that we have established a stable foundation, we will add lower extremity movement. This is vital because as we walk we need to coordinate lumbar stabilization with movement since we live in an upright and moving forward society. Lay flat on your back with the top of your head a fist length away from a wall. Raise your lower extremity to 90-90 in the air. Press your hands firmly against the wall above your head and alternately extend one leg at a time. Key is to extend each leg far enough that your lower back region stays in contact with the floor. If your lower back loses contact with the floor then you have extended your leg too far. Complete 3 sets of 8 without lumbar area coming off the surface. When decreasing lower back pain, we need to understand the co-contractions needed to maintain stability for the whole body. When establishing stability in the lumbar spine, other regions need to stabilize as well. The trunk and lower back never contract independently so we need to train our body how to co-contract our upper and lower body simultaneously. Set up on your hands and knees like a table. Be sure to place hands in line with your shoulders and your knees in line with your hips. Open hands as wide as possible and put pressure on your toes. Slowly raise up by lifting your knees 2 cm from the floor. Maintain a neutral spine by keeping it as straight as possible. Hold for 10 seconds and progress the hold time without losing proper positioning. Hip mobility is vital for preventing lower back pain, primarily hip internal rotation. This holds true for those with severe lower back pain, most likely hip internal rotation is limited one side greater then the other. Actively stretching the hip in rotation will help decrease the compensation of the lumbar spine to make up for lack of motion in the hips. While on the floor, place one leg in front in a figure four position and place the other leg behind you. 1. Actively bring your trunk forward to feel a stretch in your glutes. 2. With the back, actively rotate the hip by moving the lower leg in and out. Complete 15 active movements in the trunk and the lower leg separately. Just as important as hip mobility is thoracic mobility. The body with functions in the path of least resistance. If there is thoracic mobility issues then our body will move to next area that does not require to work hard – Lumbar Spine. This then causes pain because it is not supposed to use this path for the movement desired. Set up with your hands and knees in a table position. Then take one leg and place it in front so that the foot is in contact with the ground. Take the opposite hand and place behind your head. Maintain this position while rotating your trunk from one side to the other. Motus Specialists Physical Therapy, Inc.